Ordinary people. The courage to say no. The photo was taken in Hamburg in 1936, during the celebrations for the launch of a ship. 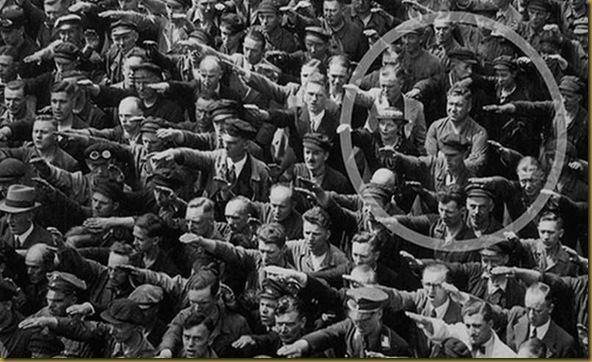 In the crowed, one person refuses to raise his arm to give the Nazi salute. The man was August Landmesser. He had already been in trouble with the authorities, having been sentenced to two years hard labour for marrying a Jewish woman. We know little else about August Landmesser, except that he had two children. By pure chance, one of his children recognized her father in this photo when it was published in a German newspaper in 1991. How proud she must have been in that moment. This entry was posted in From Lieven. and tagged anti-nazi, proud of it. Bookmark the permalink. So glad someone saved this picture. This was a brave man with courage of his convictions. Understandable that he refused to raise his arm. He showed a lot of civil courage and brought himself in danger. I wish, I would be that brave!